The brief for this project asked for a model souvenir that could represent present-day New York City. Born of a pragmatic compromise, fire escapes reconcile 19th century housing stock with 21st century safety standards. Every borough has them, and not one begrudges them. They’re even more universal than the Yankees. When we lived in New York we had a fire escape. We never once needed to flee a fire, but we used it plenty, its prosaic architecture belying the experiences it made possible. We grew plants out there, ate dinner, and basked in the views and the late summer sun. It was an incredible escape from the confines of our apartment. In this regard, the humble fire escape seemed to open a world of possibilities when other aspects of city life appeared to close in on us. The fire escape became more than a code requirement: it was an aspiration. 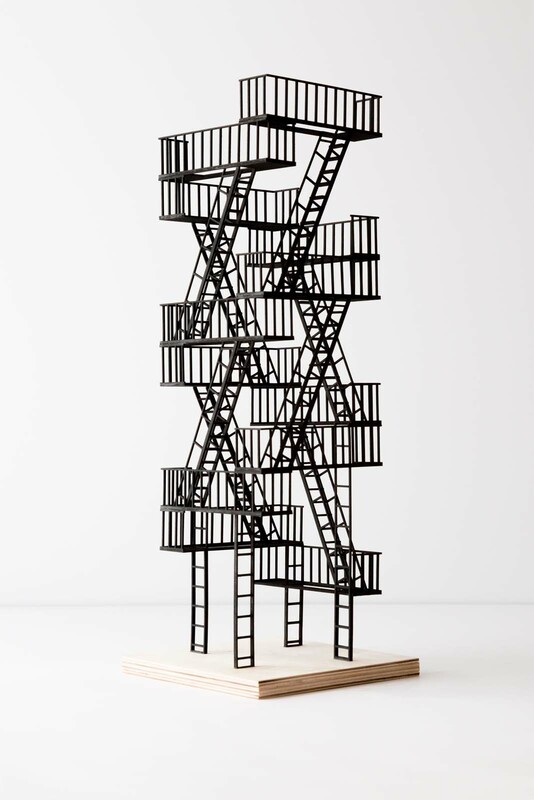 Our proposal imagines a new life for the fire escape. No longer dependent on squat townhouses and tenements for support, it’s free to be itself. Its filigree architecture multiplies, it spirals upward, and it makes new friends. It even tries on a new look, the vertical form of a Manhattan skyscraper. Like most New Yorkers, it is happiest when trying to reinvent itself. ESCAPE was commissioned by Storefront for Art and Architecture for the exhibition Souvenirs: New New York Icons. The exhibition is open through November 2017.